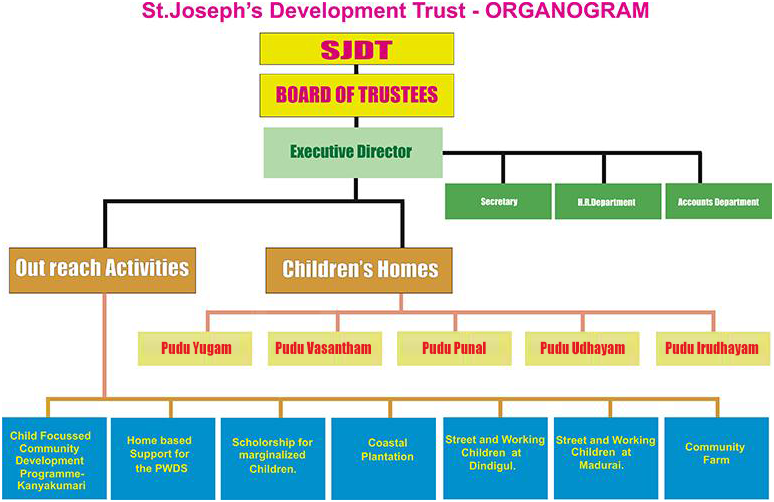 St. Joseph's Development Trust (SJDT) founded in the year 1992, committed to the cause of children and women development. SJDT has a number of programmes for children and women development with the support of the Government of India, the Government of Tamil Nadu and many International Funding Agencies. Kingdom of brotherhood where equality and social justice reign, everyone's right is respected and equal opportunity is provided for all. SJDT participates with the grass root level people seeks to serve irrespective of caste, creed or religion, the weaker sections of the society - the women, children, youth, marginalized communities and offer them the opportunities for developing their potentials leading them to have a self sustaining life. SJDT follows MEALS approach - Motivating, Equipping, Accompanying, Linking, and Sustaining as the five steps of the development process. MEALS, the five step approach serves as the guiding framework in all our interventions.